Home Archive for category "Plus Size Fashion"
The much-anticipated Girl with Curls x Lane Bryant is now available in stores & online. For those who are not familiar this is first Lane Bryant designer collaboration by plus size influencer and blogger. Fans of Tanesha and Girl with Curves have a chance to see her personal reflected through this 20-piece collection. Items start at $35 and sizes go up to 28 (some pieces are only available in 10-12). Of course, we were excited to view this collection and select some of our favorite pieces to add to our wish list. Check out some of our favorite pieces from the collection below. As a thank you to the fans there is a special 15% discount from today –9/30. Use code GWCxLB at checkout. 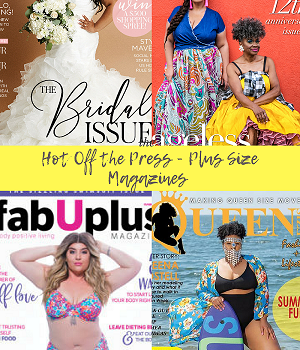 We hope this collection leads to more plus size bloggers and influencers collections in the future. Be sure to pick your favorite pieces from the collection. Congratulations again to Tanesha and everyone involved in making this collection become a reality. There is a magazine that pretty much covers any topic you can think of. While many are moving folding or converting to digital fashion magazines are still popular. However, plus size fashion isn’t always represented. Fortunately, there are several plus size fashion magazines that are working hard on changing that. If you aren’t familiar I have a gathered a few that you should check out.